Burgeoning city-fringe suburb Green Square will become home to Sydney’s third hotel from Crown Group, with a 90-key hotel due to open mid-year as part of a mixed-use development. Skye Suites Green Square will feature within the $575 million Infinity by Crown Group complex, which itself will also contain 326 residential apartments. Community facilities will include a supermarket, retail and dining precinct, while event planners can take advantage of a convention centre. Guests of the hotel will also have access to the Green Square Library, while a public swimming pool will also be located nearby. The 90 apartments will consist of studio, one and two-bedroom layouts. Guests will enjoy keyless entry, access to virtual concierge tablets in rooms and STARCast television systems allowing for streaming of personal entertainment libraries. Complimentary mini-bar, Kevin Murphy toiletries and the ability to modify the mattress to suit individual firmness preferences will all feature as hallmarks of the hotel accommodations. Crown Group Director of Hotels and Suites Wayne Taranto said SKYE Suites aimed to differentiate itself by being located within iconic architecture and focusing on bespoke service. 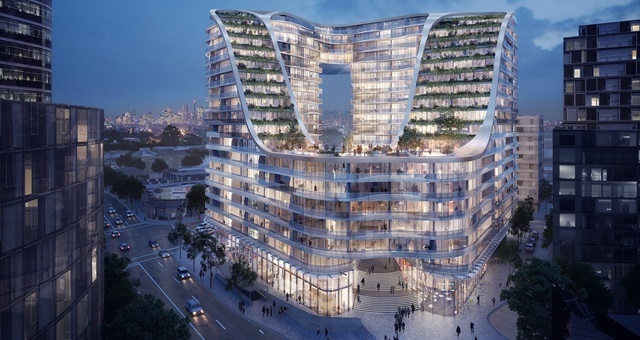 Designed by Koichi Takada Architects with a looped semi-circle exterior on the corner of Botany Road and Bourke Street, the development will be about 10 minutes to Sydney Airport. A variety of urban town centres have popped up amid the Green Square industrial hub in recent years, transforming the area into a highly-sought lifestyle precinct with abundant parkland, close to Botany Bay. The new development follows the opening of Sydney’s first SKYE Suites in Parramatta in 2017, followed a little over a year later by SKYE Suites Sydney.